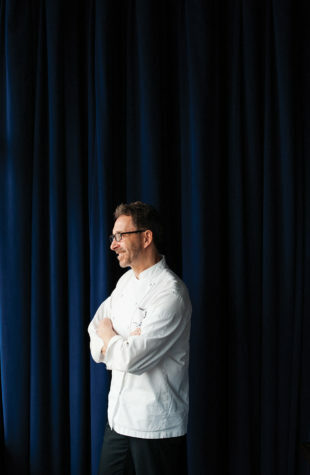 “I swear that every single day I walk into this restaurant, I am immediately captivated by the sea air and all I can think about is preparing and devouring an obscene amount of oysters, lobsters, and scallops,” chef and owner David Turin tells me in his waterfront Kennebunkport restaurant, David’s KPT. Moving into its third summer in operation, it has done nothing but grow exponentially in popularity, combining both familiar menu elements from Turin’s Portland-area establishments as well as more archetypal “Maine” fare to appease the throngs of tourists that pack Kennebunkport through the summer and fall months. As Turin puts it, “all of my crew, from 388 in South Portland to Opus Ten in Portland, strives to create dishes that at the end of the day have a certain practicality to them. I like to think that a dish is never done until you can’t take any element away from it.” Crispy potstickers with sliced Asian-style beef and creamy wild mushroom pappardelle exist in perfect harmony with the classic lobster roll, which can be made with butter or mayonnaise to prevent any potential arguments over which way is best. The idea for this venture, a partnership with Kennebunk Resort Collection (KRC), took root a few years ago at the Kennebunkport Festival. Turin was serving his classic butter-poached lobster, a simple yet beautifully executed dish that quickly became the crowd favorite. 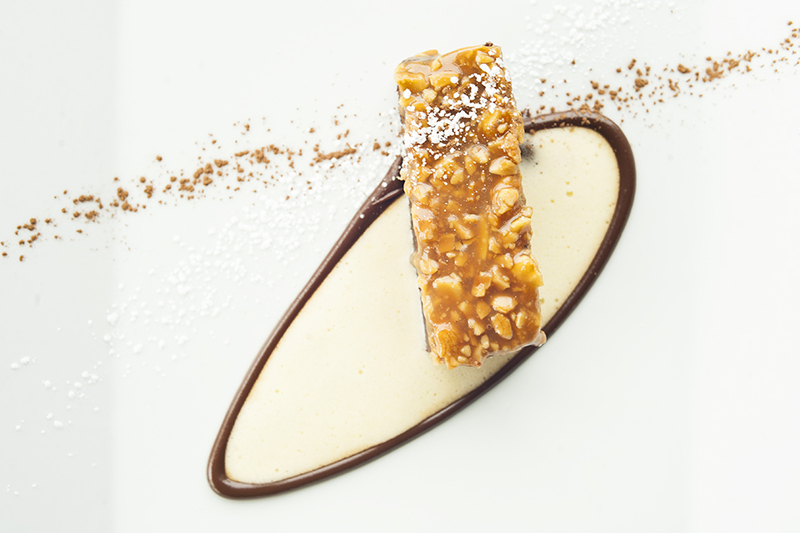 After taking the reins at one of the many Art of Dining feasts held at private residences during the festival, Tim Harrington, partner and creative director at KRC, visited Portland to try Turin’s tasting menu-driven David’s Opus Ten. The two immediately hit it off and not long after they forged a partnership and David’s KPT was born. “It’s amazing what little butter-poached lobster can do,” Turin jokes. 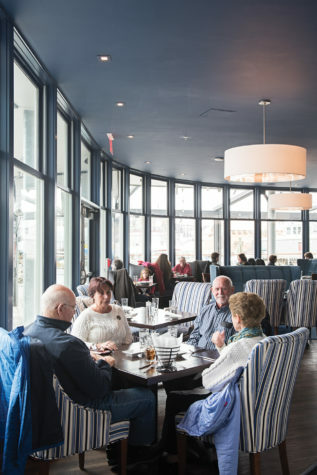 Although designer Kim Mim had started the initial build-out of the space, originally intended to be a different restaurant altogether, when the idea for David’s KPT was born, the aesthetic was taken over by Harrington and designer Louise Hurlbutt. 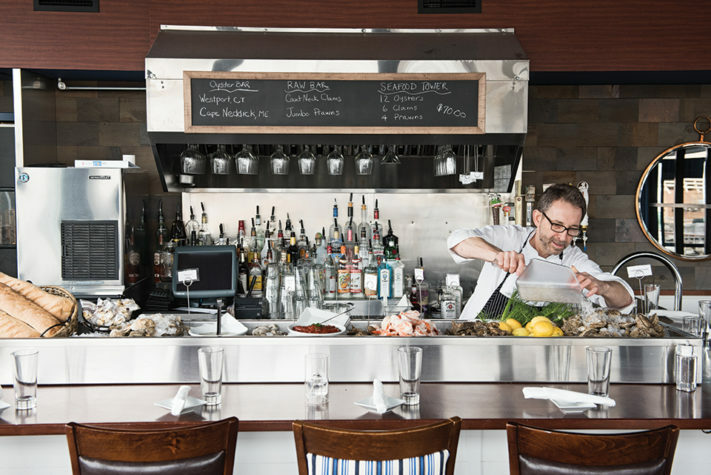 “We were aiming for an airy, nautical theme,” explains Hurlbutt. “To achieve this we changed the overall color scheme to white and navy while opening the room up by replacing the heavy drapes with all glass windows.” In addition to the existing bar, another longer bar was built using reclaimed wood topped with a gorgeous leather-finished granite top. 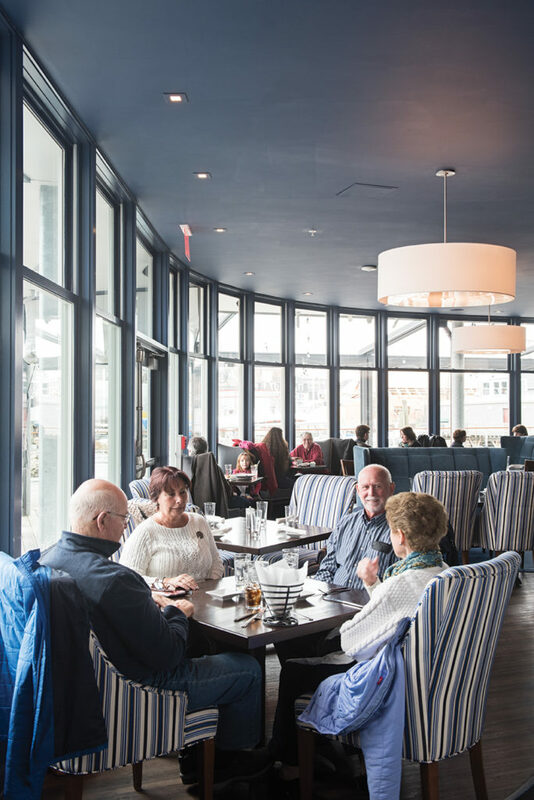 A bright navy rug perfectly complements the plush, high-back chairs in the dining room, and the recent addition of an adjoining raw bar rounds out the seaside experience. On the raw bar there is a plethora of oyster species, clams, and prawns, all available in the classic, multi-level “Tower” form for those looking to indulge, or just perhaps to cause a spectacle to impress out-of-town guests. There are also a variety of composed oysters available in flights, which on a recent visit included three Cape Neddicks topped with a thought-provoking array of toppings, most notably with tangy grapefruit and aromatic fennel. Each of the three bars has a very different feel to it, and the range of cocktails available mirrors this concept. “The Moxie” combines the Art in Age “root” liqueur with Fernet Branca to emulate the same kind of sweet and bitter qualities of Maine’s favorite beverage, while other selections, such as the “Bourbon Arnold Palmer,” are custom designed to be quickly consumed on the deck, while basking in the hot sun. 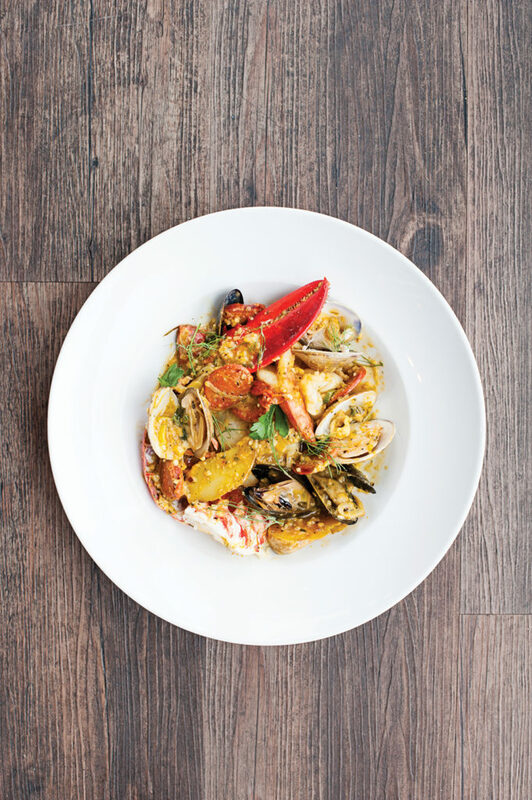 A reasonable selection of both white Burgundy and crisp whites from Austria, the Loire Valley, and Alsace are refreshingly appropriate alongside both hot and cold seafood dishes. Turin’s version of velvety clam chowder with a touch of sweetness from brown sugar that complements the smoke from the bacon, to “Thai-style” fried calamari, a sort of Asian-inspired homage to the Rhode Island-style topped with pickled cherry peppers, peanuts, and cilantro. Overseeing day-to-day operations to accommodate Turin’s hectic schedule is executive sous chef Derek Federico, who also shares his penchant for globally inspired cuisine. The amount of ground the menu covers stylistically is quite impressive, which is evident in the Catalan seafood and bread stew. The broth is thickened with picada, a traditional paste consisting of fried bread, almonds, and a touch of stock, before being simmered with tomato and piled high with shrimp, hake, mussels, clams, and chorizo. “I created this version of the classic stew as a course for a Spanish wine dinner I prepared last winter,” Turin tells me, “And I knew I definitely wanted to keep it around for awhile. 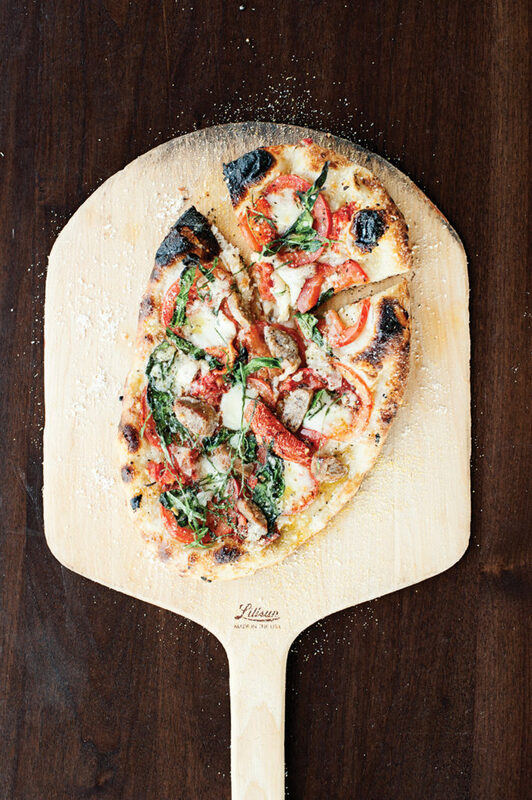 As with his Monument Square restaurant, David’s KPT offers a full range of pizzas from the traditional napoletana margherita with tomato, mozzarella, basil, and garlic, to jerk chicken with goat cheese and arugula. “This is my absolute favorite station to work, especially on busy nights,” Turin continues, “I love our crust, and I could seriously put anything on it. Plus, to be honest, I really can’t get enough of tossing the pizza dough.” Of course, it doesn’t hurt that KPT spared no expense with its stone-lined, Italian-made deck oven, which only gets better after each and every pizza that comes out of it. The red wine portion of the list is quite balanced, and though there are certainly trophy bottles, like Opus One, to be had, there are also quite a few very reasonably priced gems, such as the Castellare Chianti classico. This particular bottle paired beautifully with a heaping plate of pork osso bucco, slowly braised until falling apart and served over a rich, almost cassoulet-like ragout of wine beans and bacon, balanced out by a dollop of gremolata to cut through the fat. Of course, the wine would also be equally appropriate with Turin’s classic burger, made with high-quality beef, cheddar, and cherrywood bacon, served with truffled french fries. It is certainly worth mentioning that David’s KPT is open year-round, seven days a week, serving three meals a day (as it is housed within the hotel). Knowing that, Turin set out to create a menu that has what he calls both “broad appeal” and “intrinsic value.” He set out to both welcome visitors to the state, while keeping things fresh for the locals and, equally important, himself.